Photos, pricing and shipping information, links to other sites etc. Devil Fish User Manual. Version 5.0 includes a 3.5mm headphone socket and a low voltage dropout system to protect the C-cell batteries from being completely discharged if the machine is accidentally left running from these batteries for several days. The three toggle switches of 5.0 Devil Fishes look the same as those of earlier versions, but are of a different type with a more definite 3 position feel. They should retain this feel for decades, whereas the three positions of the previous switches tended to become less definite with a few years use. Battery arrangements for retaining memory data in the Devil Fish. Instead of the cylindrical, soldered-in, non-rechargeable lithium battery we used until late 2016, TB-303 Devil Fish memory data is now retained with a user-changeable 2032 non-rechargeable lithium coin cell. These should last for at least ten years and can be easily replaced by removing the back panel. The system also includes a large capacitor to keep memory data alive for several days in the absence of power, C-cell batteries or the lithium battery. Manual for the MIDI In System V1.0.4. Manual for the MIDI In and Out System with Dynamic Bank and/or Channel Switching. The MIDI In and Out system has numerous capabilities, including the ability to operate as a CV to MIDI converter. Dynamic Channel Switching involves switching the Devil Fish synthesizer and MIDI Out between the notes received on four contiguous MIDI In channels, according to MIDI commands, toggle switch movements and two Audio or CV inputs. Manual for the MIDI In System V1.0.0 to V1.0.3. This includes descriptions of and workarounds for two bugs: MIDI In notes are played 1 semitone higher than they should be and invalid data may be written to the non-volatile memory which stores the settings for the MIDI In system. Manual for the 32 Bank Memory System. Manual for the 32 Bank Memory System with Dynamic Bank Switching (DBS) or Dynamic Bank/Channel Switching (DBCS, with the MIDI In and Out system). midi-options/ This covers the Devil Fish MIDI In system and the Devil Fish MIDI In and Out system. The Sonic Potions MIDI In and Out CPU replacement system is another possibility. videos/ Videos of Devil Fishes in action. ECO/ Engineering Change Orders - technician-installable hardware changes to solve problems with Devil Fishes which we discovered after shipping the machines to their owners. Also, in some cases, workarounds to get around these problems without hardware changes. TT-303/ Information on the Cyclone Analogic TT-303 Bass Bot. Please do not press down on the six small knobs of the Bass Bot while turning them! This can cause the pot's rotor to cut through the conductive tracks. The same is true of the TB-303's original pots. Prices for customers in Australia and overseas. TR-606, TR-808 and TR-909 modifications. 32 Megabyte memory boards for Akai samplers. 1993. The first V2.0 versions, on which the current modifications are based, were in 1996. To the Real World Interfaces page. To the main First Principles site. We intend to be working on Bass Bots (TT-303 Mk 1) later in 2019. Please follow the TT-303 link above for more information. The Devil Fish mods should also be applicable to the RE-303 http://re-303.com . There should be no electronic problems modifying them since the circuit board design is based directly on that of the TB-303. 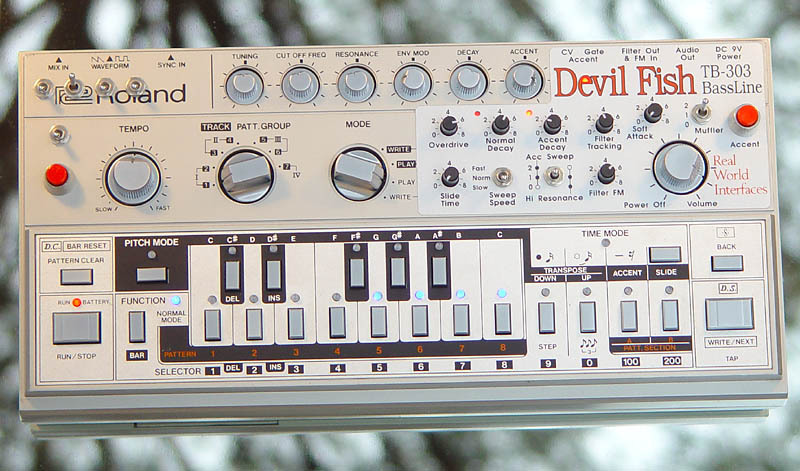 The 32 Bank Memory system and the Devil Fish MIDI In and MIDI In and Out systems are only applicable to machines with an original TB-303 CPU. We have not yet had an RE-303 in the workshop. There will be some extra work fitting the Devil Fish mods into cases such as those made by Kumptronics in Austria: https://www.kumptronics.com/diy-projects/dinsync-re-303/ . 18 December 2018: The Quicksilver 303 CPU replacement system, with MIDI In and Out, is no longer available. I will try a Sonic Potions CPU replacement system ( https://www.sonic-potions.com/re303 ) which also has MIDI In and Out. This can't provide Filter Frequency control (as is done by the Devil Fish MIDI In and MIDI In and Out systems, and which the Quicksilver 303 system also provided) and there is little prospect of it doing so in the future since there are no pins available for the requisite PWM signal. 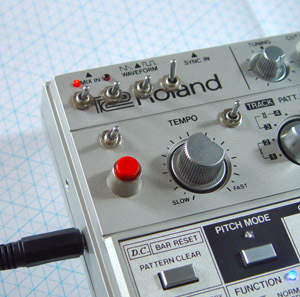 Roland's TB-03 does not use analogue circuitry. Instead of the transistors and integrated circuits which produce voltages for audio and control, with the filter being done by transistors (operating as diodes) as the vertical segments of a ladder, with capacitors as the rungs, all the sound generation and control is done with digital calculations. This is no-doubt a good, reliable, compact and cost-effective way of producing sound, but it is not at all amenable to modifications such as the Devil Fish. 7 February 2016: I have added an ECO directory, as mentioned above, for technician-installable hardware changes to correct problems in Devil Fishes which we discovered after sending the machines to customers. Devil Fish owners: please take a look at this page to see which of these problems may apply to your machine. 15th September 2014: I have completed the MIDI In and Out system, with its Dynamic Bank and Channel Switching capabilities. See the Devil Fish MIDI In and Out Manual (the link is above) for the full documentation of these. Int Seq mode Note pitches result from the Internal Sequencer when it is playing a pattern, in Pattern Write, Pattern Play, Track Write or Track Play modes. Ext CV mode Note pitches result from measuring the voltage of an externally applied Pitch CV, plugged into the CV In socket – or, if no lead is plugged into this socket, by measuring the internally generated CV (from the TB-303’s 6 bit DAC) which results from the Internal Sequencer playing notes during Pattern Write mode when it is not playing the pattern. This is when the user is entering and altering pitch, timing, Accent and Slide information. MIDI In Follow mode When the MIDI In system has reception of Notes and Control Changes ON (hold TAP and press and release BACK), the MIDI Out system replicates via MIDI Out Note On and Off messages the notes the MIDI In system is playing on the Devil Fish. This includes the way notes are generated with Dynamic Channel Switching. For full functional details of these modes, please see the MIDI Out further explanation section of the user manual. We have a new modification for the 32 Bank Memory system. For the TB-303 Devil Fish (with or without the MIDI In and Out system or the MIDI In system), for the TR-606 and for the TR-808, Dynamic Bank Switching (DBS) enables two external Audio/CV signals (or potentially four for the TR-808) to alter the currently selected memory bank, instantaneously. This is done by detecting the signal exceeds about +1.15 volts, and using this to invert one of the five address bits which select which of the 32 memory banks is currently accessible to the Internal Sequencer. You can hear DBS in action with both the Devil Fish TB-303 and a TR-606 in Lincoln Webber's late 2015 video: https://youtu.be/FV9g7xBsPYA . An earlier video, mentioned below, https://youtu.be/grjqTnyf8Ss shows how it works with the Devil Fish. The following description concerns memory bank switching, but the same two inputs, detector circuits and switches can also be part of Dynamic (MIDI In) Channel Switching, in Devil Fishes with the MIDI In and Out system. The primary purpose of this is to enable switching between patterns, moment-by-moment, in response to manipulation of the toggle-switches and pushbutton and in response to external audio or CV signals. Since the Internal Sequencer reads from memory every time it plays a note, this means that notes from patterns in various memory banks can be played in the middle of patterns. The manual for this is above: #MEMDBSMAN . 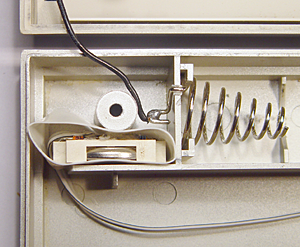 The only visible parts of this are two 3.5mm sockets on the left of the machine, and two LEDs, which, when on, indicate that the detector circuit has been activated and that the address bit from the corresponding toggle-switch will be inverted before it is used to select one of the 32 memory banks. 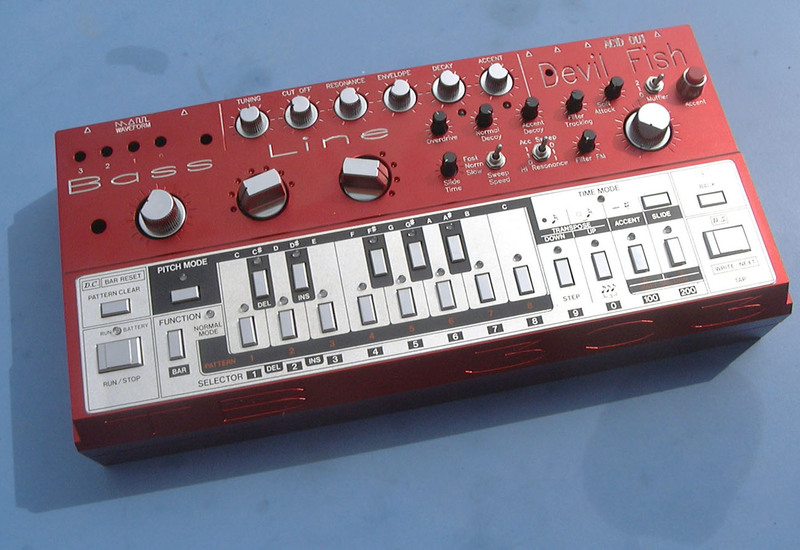 Here is a description of Dynamic Bank Switching (DBS) for the TB-303 Devil Fish, which involves just the switches, input sockets and LEDs - not the MIDI functions. The same capabilities will be possible for the TR-606 and in 2 and 4 channel versions for the TR-808. The DBS hardware for consists of two 3.5mm audio or CV input sockets on the left of the machine. Whenever the audio or CV input signal becomes more positive than +1.15 volts (which high level audio signals will exceed in the positive part of their waveforms), the circuit turns on. The circuit remains on for about 33 milliseconds after the input signal goes below the +1.15 volt threshold. So audio signals of 30Hz and higher (and somewhat lower, depending on the waveform) will produce a continual On state as long as part of their waveform exceeds about +1.15 volts. The inputs can handle -15 to +15 volts. When the detector circuit is On, its Red LED is On and the address bit which is generated by the associated toggle-switch is inverted. If the detector circuit is Off, everything is as per normal: The low and high positions of the toggle-switch produce 0 and 1 respectively for the address bit. This is one of the 5 bits which selects one of 32 (2 x 2 x 2 x 2 x 2 = 25) memory banks, numbered 0 to 31. When the detector circuit (and so the LED) is On, the low and high switch positions produce 1 and 0 respectively, thereby selecting a different memory bank than when the circuit is Off. Each of these sockets, detector circuits and LEDs is like an audio or CV controlled version of the Red pushbutton switch of the 32 Bank Memory system. That pushbutton inverts the address bit produced by toggle-switch 4. The two new inputs invert the address bit produced by toggle-switches 3 and 2. This means audio or CV signals can switch the Internal Sequencer from playing a pattern in a particular bank of memory to playing the same pattern number in some other bank of memory whose 5 bit address differs in one bit. Since the Internal Sequencer looks into memory for each note it plays, this means that the notes it plays, with Accent and Slide, can chop and change between those from patterns in multiple banks of memory, in the middle of a pattern. The Devil Fish synthesizer and, if it is installed, the Devil Fish MIDI In and Out system and its one more slave devices, will play this set of notes. In this demo he is using as inputs a CV from an LFO and the Accent CV out of the Devil Fish itself. He is not using audio signals as inputs or driving a slave device from MIDI Out. In this configuration, the Accent signal is coming from him pressing the Accent Button or from any Accents which may be programmed into the pattern. A simple and elegant approach is to alternate between two patterns with an LFO which is running with a cycle just a little slower or faster than the pattern time itself. Lincoln is doing this with one of the signals. Since there are two channels, there are four patterns which can be selected by the four combinations of the two input signal states. One or both input channels could be MIDI controlled by driving any MIDI synthesizer with Note On and Off events and using its audio signal, perhaps through an amplifier if its positive peaks do not already exceed about +1.15 volts. With the MIDI In and Out system, if nothing is plugged into an input socket, the output of the socket (the input to the detector circuit) can be driven by a signal derived from MIDI In: Note and/or Control Change messages received on Channel 15 or 16. The above timing chart is for all switches being down, with the pushbutton not activated. At any time these can be activated, and in the case of switches 2 and 3, this would invert the bits shown above, thereby selecting different banks. I was prompted to devise this modification by discussions with Ricardo Velarde and Lincoln Webber. Lincoln has some other Devil Fish videos here. Here is some more information about the MIDI Out functions of the MIDI In and Out system. Automatic turnoff of Run/Stop drive to the TB-303 due to MIDI In Sync reception, if while this Run/Stop being on, there are no MIDI In Clock bytes for 1.5 seconds. This can be disabled. The ability to turn on and off the reception of MIDI notes and most Control Changes, as with previous versions of the MIDI In system (but without halting the reception of MIDI In Sync), with the ability to allow the reception of Filter Frequency Control Changes at all times. 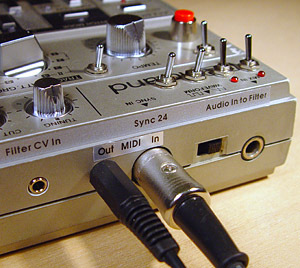 This enables turning MIDI In note and Control Change reception on and off (with two differently timed combinations of pressing the Back and Tap buttons) while the Internal Sequencer is running, so alternating between external (MIDI In) and Internal Sequencer control, while patterns are playing while still allowing external control of the Filter Frequency. Stronger drive from the Accent CV Out so it can drive the Slide In CV socket sufficiently to turn on both Slide and Gate. Suppression of capacitive coupling in 5 conductor MIDI cables from the MIDI signal wires to the DIN Sync Run/Stop and Clock wires. Hardware reset of the Internal Sequencer's Accent flip-flop at power on to prevent the occasional problem of notes being played with Accent on when CV and Gate inputs are used. locked the studio and started to build sounds. Nobody can stop them now. They are very happy and they say thank you thousand times! synthesizers before but... I've never imagined a "relatively simple"
synth such as my Teebee will transmute into such a miracle. only to the lowpass which in turn is sent to the DF audio in to filter. interesting how it all evolved. and in many other countries, musicians have placed themselves in the care of the Devil Fish. CV input for Filter Frequency. Overdrive pot to control the level of oscillator going to the filter: zero to 66.6 times normal level. Separate control of Main Envelope Generator times in accented and non-accented notes. Volume envelope is no longer fixed, and can be varied from 16 msec through 3 seconds – and to no decay at all, i.e. for notes which last indefinitely. Slide time is variable to five times longer than normal. Variable Filter Tracking causes the oscillator CV to control the filter frequency. Internal Filter FM: a unique approach of AC coupled Filter FM from the audio output of the VCA. The Muffler is a unique post-VCA soft-clip distortion circuit which retains bass response. Push-button to manually activate Accent. Filter can be switched to self resonance. Accent Sweep has three modes and can be disabled. Filter Cut Off pot range doubled to 5 kHz max, and widened to include much lower frequencies. Env Mod pot range extended to include zero and go as high as three times the normal maximum. There are new battery arrangements in 2015 for retaining memory data, which do not involve us sending Devil Fishes containing lithium batteries by air-freight. See the DF-Memory-Backup.pdf manual for further details: #DFMB. The C-cell batteries provide backup power to the memory system, and a new under-voltage protection circuit ensures that these will not be flattened if the machine is accidentally left running from these batteries for a long time. A large capacitor enables the machine to retain memory contents for a longer period than usual without these C-cell batteries and without being run from an external power supply. There is an internal holder for a 2032 20mm x 3.2mm coin/button cell lithium battery, which can be accessed by removing the bottom part of the case (photo). Overseas customers can install a 2032 battery in this, after which there is no need for C-cell batteries other than for operating the machine. When we ship Devil Fishes to Australian customers, by road, we install the 2032 battery. The 2032 battery should last for ten or more years. The six TB-303 knobs Tuning to Accent are mounted 1.5mm higher, making them easier to turn. More details: knob-heights/ . 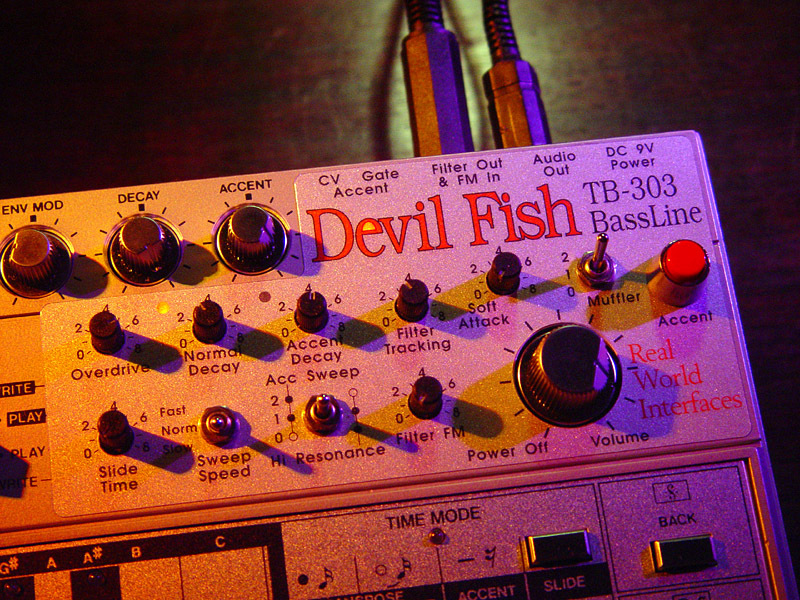 The Devil Fish can still sound like a TB-303. 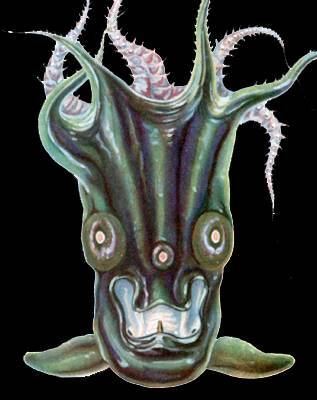 See page 7 of: Devil-Fish-Manual.pdf . The original Headphone signal is now available on a 3.5mm socket mounted between and above the Power and Audio Output sockets. The Audio In to Filter signal is plugged into the old 6.5mm mono Mix In socket, on the left of the rear panel. There is an option (see below) for a three position toggle-switch to control this signal. The Audio In to Frequency Modulate the Filter signal is plugged into the old Headphone socket, with the tip of the socket accepting this signal. This means a mono 6.5mm plug can be used for this function. The Audio Out from Filter signal is driven to the ring of the old Headphone socket. There it can be accessed with a suitable stereo plug, or by partially inserting a 6.5mm mono plug. To make it easy to use the Audio In to Frequency Modulate the Filter and the Audio Out from Filter, the Devil Fish is supplied with a special lead with a 6.5mm stereo socket and two 6.5mm mono plugs on a Y-lead. 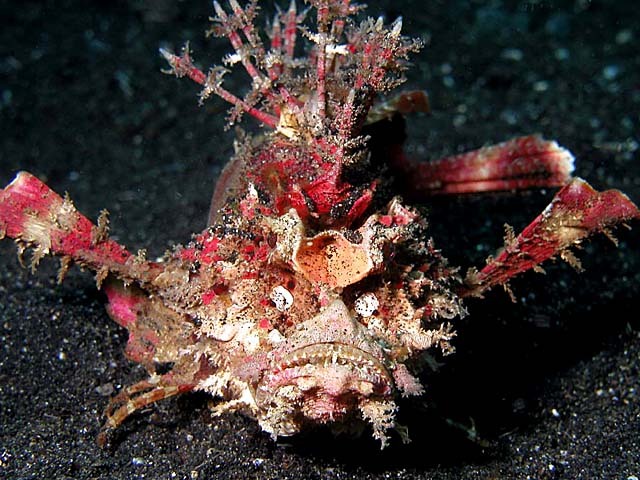 "Devil Fish", Lembeh Strait, Bunaken, Indonesia. © Ken Knezick. The optional 32 bank memory system enables switching between banks while a pattern is playing. So the sequencer reads the next note from the same pattern number in the new bank. This enables much more interesting and unexpected results than are obtainable by having the sequence change from one pattern to another, which it only does at the end of each pattern. There is a second version of the 32 Bank Memory System manual which covers Dynamic Bank Switching (DBS if there is no MIDI In and Out system) or Dynamic Bank and MIDI In Channel Switching (DBCS), if the MIDI In and Out system is installed: DF-32-Bank-Mem-DBS-Manual.pdf . The DBS/DBCS versions of the 32 Bank Memory System can be fitted with an optional Disable Switch, which enables or disables the detectors of the two approximately +1.15 volt Audio/CV input sockets. This switch is normally mounted to the right of the Tempo knob. Detector circuits and their LEDs and address bit inversion circuits are enabled. There is also a special Sync Lead which accepts MIDI In, and provides a daisy-chain of three Sync out connectors to drive, for instance, devices such as other TB-303s or Devil Fishes, TR-808s or TR-606s. See the sync-lead/ page. New LEDs in Red, Orange, Yellow, Green, Blue and White: leds/ . We suggest all Blue LEDs, except for the Run/Stop LED, in which we install a new Red LED. These are a broader blue spectrum than most blue LEDs, with more violet – a somewhat different colour than the slightly aqua color of most blue LEDs. They are also a good brightness, whereas the ordinary blue LEDs are too bright unless the drive circuits are adjusted. 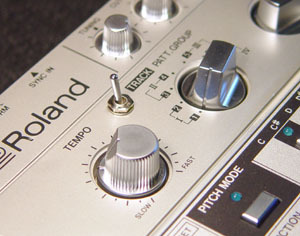 The six small pots along the top of the TB-303 sometimes fail. Between about 2004 and 2012 we replaced them with newly manufactured pots from Technology Transplant (this company ceased operations in 2015/16) and since 2013 we have been using pots identical to those in the Cyclone Analogic TT-303 Bass Bot. I dismantle these pots and replace the original friction grease with a lighter grade silicone grease, so the 6 small knobs are very easy to turn. I also modify them to reduce side-to-side and up-down movement, which should also prevent the edge of the rotor cutting the conductive tracks if the knob is turned while downwards pressure is applied. This was the main failure mode of the original ALPS pots. 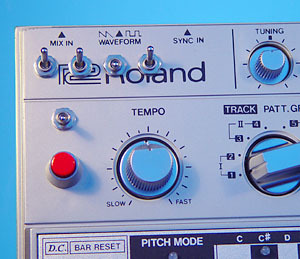 Nonetheless, please try not to apply downwards pressure on any TB-303 or TR-606 small pots while turning them. The Tempo and Volume pots rarely fail, but I can replace them. I usually fix a noisy volume pot by dismantling and cleaning it. The two rotary switches have never failed, in my experience. I now have a technique for spray painting the parts of the case which are worn around the 6 small pots. Where the markings and silver paint are worn away, I can spray some silver and by hand colour in new markings. Please see the refurb/ page for more on this. Switch for Audio In to Filter. In the Devil Fish, the old Mix In socket is used for feeding an external audio signal into the filter, in addition to whatever amount of the Oscillator is selected by the Overdrive pot. Since this pot can be turned down to zero, it is possible to run the machine without its internal oscillator and have the Filter processing purely an external signal. Audio In enabled, but spring return to Mid position. This enables convenient switching of the external signal, including dropping in short bursts of it by pressing the switch to the down position, with the toggle returning to the mid position as soon as the finger pressure is released. AluCases are machined from solid billets of aluminium. No matter how they may be banged around, dropped etc. the case will be practically indestructible, so providing good protection for the TB-303 and Devil Fish electronics for the decades and centuries to come. Martin has a small stock of partially completed AluCases and will finalize, anodize and apply the epoxy paint to the lettering according to your specifications. There is a wide choice of colours for the anodizing and the epoxy paint. 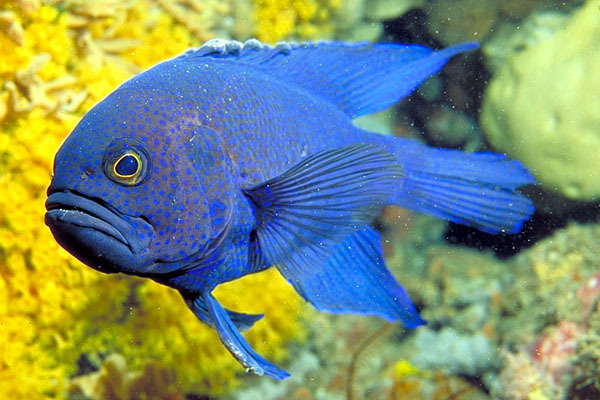 Please see the photos/ directory for images of some AluCase Devil Fishes. There are extra costs installing the machine in an AluCase, and some extra shipping costs due to the extra weight and the larger carton we use. These extra costs and the cost of the AluCase total around AUD$2000, depending on the options and current exchange rates. It is generally best for the customer to work with me regarding the options they want for their Devil Fish, and then for me to communicate this to Martin, with the final choices about colours and lettering being between the customer and Martin. Generally it is best for the customer to pay Martin directly, but if necessary I can handle the whole project from a single payment. It is best to allow at least six months for Martin to complete the AluCase and ship it to Australia. Martin is a DJ and Devil Fish musician himself. Please see the videos/ directory for him and the Liquid Trolls in action. The Devil Fish MIDI In and Out system. The SonicPotions CPU replacement system. The Devil Fish is the most dynamic, pulsating, wailing musical instrument I know of. 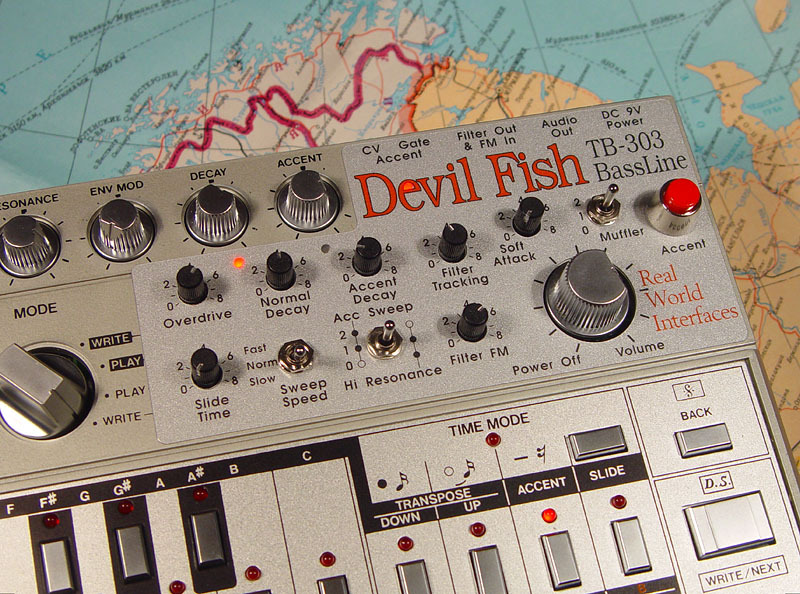 If you and your TB-303 have a sense of adventure, the Devil Fish modifications will propel you into musical territories dark, destructive, delicate, languid, undulating, exquisitely detailed, throbbing, luscious and lurid . . . . . Best of all, the spaces between these extremes can usually be traversed by judiciously turning a few knobs. Tina's illustration on the Devil Fish job progress book. 24 minutes of sound samples are in the sounds/ directory. prices-au/ Prices for customers in Australia. prices-int/ Prices for customers outside Australia. The basic modification cost includes cleaning the machine and a moderate level of repair work. If you have a Devil Fish version 1.x (1993) 2.x (2006 onwards) or 3.x then I can upgrade the machine to a 4.2 version with MIDI. It is not possible to install the MIDI In system with these older Devil Fish circuit boards. This replaces the existing Devil Fish circuit boards, so your machine will have 7 new small black pots with silver lines and three new toggle-switches in the Devil Fish panel, with new CV, Gate etc. sockets at the rear. If your machine is one of the few version 4.x machines without MIDI, the upgrade can be done with the existing circuit boards, to MIDI In or to MIDI In and Out. If you have a 4.x Devil Fish with MIDI In, I will be able to extend this to provide MIDI Out as well. If it is an earlier version than this, then the Devil Fish boards need to be replaced with current version 5.x boards in order to provide either MIDI In or MIDI In and Out. In general, we don't sell spare parts. Please see the eBay store of Sound-to-Parts in France for many specially manufactured parts for electronic musical instruments, including new battery contacts and battery compartment doors for the TB-303 and TR-606. Many or perhaps all of these parts were originally made by Technology Transplant. Before mid-2010, I replaced the tact switches with the original type, ALPS SKHCAA (now known as SKHCBEA010). These were not sealed against dust. Dust (mainly flakes of skin . . .) gets into the switch and builds up on the contacts, making the switches operate erratically. I installed them with a flexible plastic dust guard, which greatly prolonged their life. Still, after 10 years, some heavily used machines needed their switches replaced again. There are sealed tact switches from ALPS (SKQEAAA010), but I don't like them since they have a higher activation force, a much lower lower "click force" and a much lower "click displacement". Please see tact-switches/ for details. 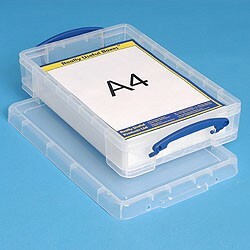 The only alternative is to use Omron B3W-4050 sealed tact switches. These are pictured above: #pots_switches. These are slightly firmer than the SKHCAAs, and have about the same initial and click displacements – so they have a very good "click" action. The Omron switches have stems which are a little too wide for the TB-303 / TR-606 buttons, so I modify the stems to make them fit the buttons. This is done with a 0.6mm Dremel cutting wheel, with two cuts at right-angle through the top part of the stem. While we can't guarantee these switches for any particular period, they are very well made and well sealed against dust and liquids. They are specified to have a life of 3,000,000 operations. Dust seems to be the only thing which makes tact switches erratic, and there's no way dust can get into these Omron switches. The page 303-mods/ discusses how to obtain the Omron switches and how to to modify them so they fit the TB-303 buttons. To support people with the task of replacing these switches, but who do not want to modify the switches themselves, we are now selling Omron switches, with their stems modified to suit TB-303 TR-606 buttons. Each pack contains 25 switches. The TB-303 needs 24 and the TR-606 needs 21. Australian customers please email us. Overseas customers, please use PayPal to send Australian AUD$90 for one pack, or AUD$160 for two, to rw@firstpr.com.au . 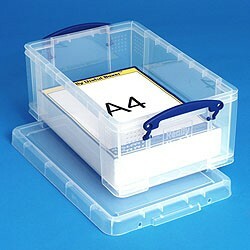 We will airmail them to you within a few days, so you should have them within two weeks at most. Tina and I aim for a three week turnaround time between you, the customer, sending your TB-303 and receiving it back as a Devil Fish. However it is best to allow four to six weeks. Please email us with your requirements and we will reply with the full pricing information, shipping address etc. I suggest copying and pasting from one of the Prices pages linked to from above: #emma, retaining only those lines in your email which are relevant to your desires. Please send the TB-303 with a reputable courier company, rather than by the post. TNT, DHL, Federal Express and your Post Office's EMS service are all good choices. The German Postpak service and a similar service from the Belgian Post Office is not a courier service and should not be used. Despite assurances about tracking numbers and someone having to sign for delivery, it will be delivered in Australia as an ordinary parcel. This means it may be left on our doorstep. 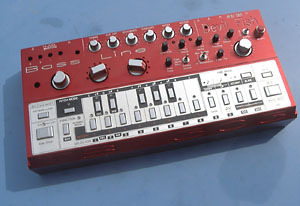 Ordinary airmail with the recipient having to sign for the package is not secure enough for an item such as a TB-303. Post Offices in many countries deliver their packages not through the Post Office of the destination country, but by various transport companies. Australian truck drivers won't understand instructions in French regarding the recipient signing for the package. Please send just the TB-303 – no batteries, vinyl carry case, or original styrofoam/cardboard box. Batteries should only be included if you do not want the 32 banks of memory and you wish to retain the existing memory contents. Memory contents cannot be retained if the 32 bank system is installed, and I can't absolutely guarantee that patterns will be retained if the memory is not installed, so please write down all important patterns before sending the machine for modification. The patch-sheet/ directory has some PDFs to help with this. The modifications are very reliable and are guaranteed for two years. We will ship your Devil Fish via Australia Post's Express Courier International (EMS) service. We normally insure the package for AUD$2000. No machine has been lost or damaged of the 200+ machines we have shipped to overseas owners since the early 1990s. It is generally best to enquire via email: rw@firstpr.com.au. We are located in Daylesford, about 120km north-west of Melbourne: Wikipedia, Google-Maps. Sound Samples These are in the sounds/ directory. Videos There are an increasing number of YouTube videos depicting Devil Fishes, including some live acideee action by Martin Rothlisberger (Liquid Trolls) who makes the AluCases. See the videos/ directory. Patch sheets in PDF, GIF and other formats can be found in the patch-sheet/ directory. Also in this directory you will find a single page PDF file for conveniently writing down every aspect of a TB-303 pattern. Some modifications you can do to the TB-303, including replacement of the push-button switches and some notes on the late-2009 and later Technology Transplant 6 small pots: 303-mods/ . This file also contains a few maintenance tips of interest to technicians. I am now able to refurbish the case to a limited degree regarding the silver paint and markings wearing away around the knobs, especially the Resonance and Cutoff knobs. Please see the refurb/ page for more details. Comparison of 3 types of tact switches – and why we use the Omron sealed tact switches: tact-switches/ . In December 2010, Ulf Kaiser wrote an article for Keys Magazine: www.keys.de . Thanks very much to Ine Gundersveen for this translation: Devil-Fish-article-Keys-Magazine-Dec-2010-English-tr.pdf . The main images from the cheatsheet card which accompanied the TB-303. tb-303-card/ This is a mini guide for the TB-303 sequencer's Pattern and Track writing operations. A short treatise on the exact timing of the Gate, CV and Slide in the TB-303 sequencer: 303-slide.html. Another treatise looking at the TB-303's Accent Sweep circuit and how humans respond to its pattern of pitch variations in the filter when multiple accented notes follow each other in quick succession: 303-unique.html. "Investigate feedback loops and tweak them beyond stability. controlling the frequencies, we can control the human mind. night ... who is controlled and who is controlling? A picture of the excellent 9 volt regulated, 200 mA (milliamp) Boss power adaptor which is (or was - they are no longer produced, see the next paragraph) best for the TB-303, Devil Fish, TR-606 etc. In Australia, this is called a PSA-240P. "Regulated" means that its output voltage is always very close to 9 volts irrespective of load current, up to its maximum of 200 mA. Most ordinary (mains power supply, diodes and capacitor - no regulator - but these are becoming replaced by switch-mode adaptors) power adaptors have unregulated outputs, such that with a light load, they may produce 11 volts or more. There's no way of telling just by looking at an adaptor what voltage it will actually put out when loaded relatively lightly by a TB-303 / Devil Fish. If it puts out too high a voltage, then this will cause a power transistor in the TB-303 / Devil Fish to overheat, and perhaps to fail. This over-voltage problem is more likely to occur with an adaptor which is rated at 9 volts at a high current such as 500 mA. 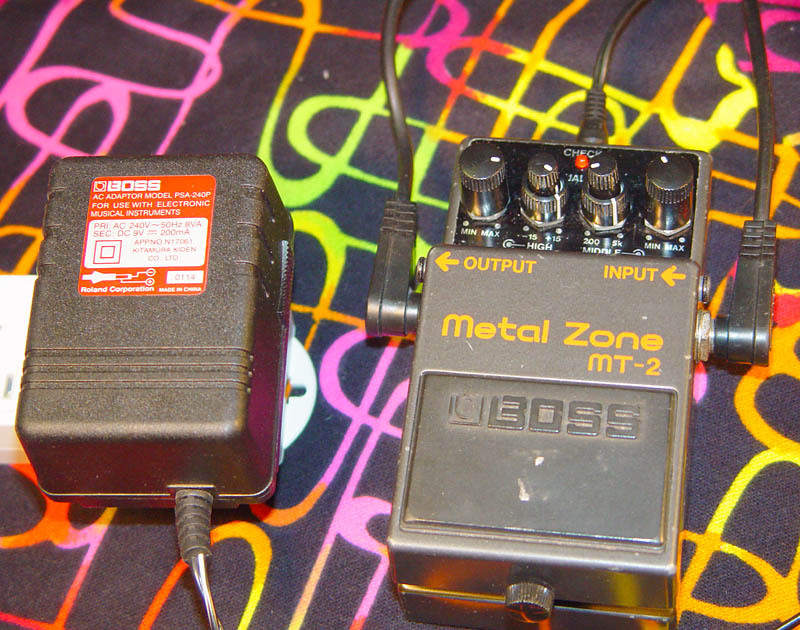 Since TB-303s are precious devices, the best approach is to buy a 200 mA 9 volt Boss adaptor! In 2012, the situation with these adaptors has changed somewhat. The Boss PSA-240, PSA-120 etc. models, with mains transformers, diodes, capacitors and an internal linear regulator are no longer produced. In their place are Boss PSA-240S, PSA-120S etc, models. These are totally different, but which also work well. They have a compact switch-mode power supply (Wikipedia article) in the adaptor, which produces a well-regulated 9 volts DC. 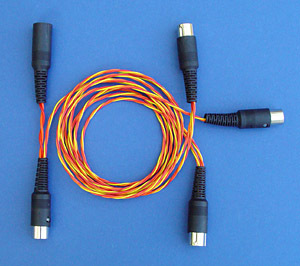 Switch-mode power supplies can introduce high frequency (such as 40kHz to 100kHz or more) interference into audio systems, and these Boss adaptors have an elaborate double toroid filter in the output cable in an effort to reduce this. Also pictured is the Boss Metal Zone MT-2 – a popular distortion and three band EQ distortion pedal which sounds great with the Devil Fish. This is Chad and Lincoln's, and we had fun in the usual configuration (passing the Devil Fish signal through the Metal Zone), and by sending the Devil Fish's output into the Metal Zone, with the Metal Zone's output going into the Audio In to Filter of the Devil Fish – with the output of the system being the Devil Fish's output, not the Metal Zone's. This caused filter oscillation right down to low frequencies, irrespective of the setting of the Resonance pot, and we got some great effects where the system would oscillate at both high and low frequencies, and subtle changes in the Devil Fish's pattern (its volume envelope, filter frequency and the pitch of the oscillator) would sometimes perturb the overall system from its normal high frequency mode of oscillation into a totally different low frequency mode. Feedback, distortion and especially a little delay can give rise to fascinating, complex and sometimes chaotic results. Lincoln says that Metal Zone aficionados / maniacs sometimes run three of them in series . 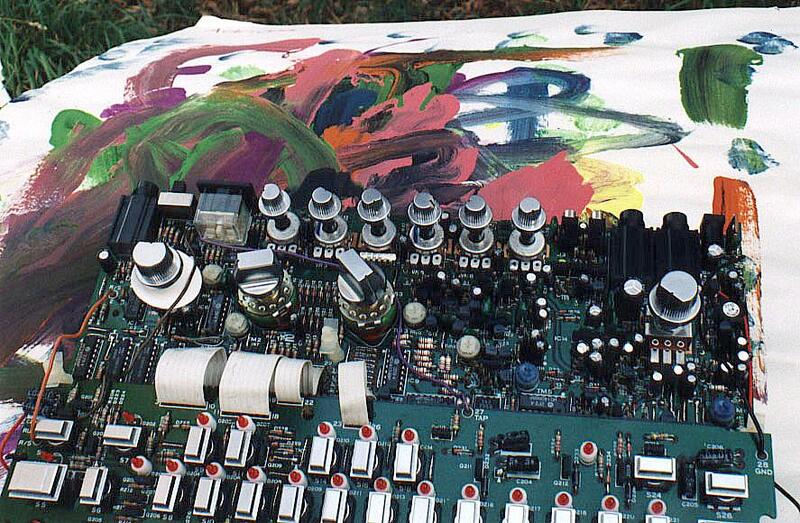 . .
A large picture of the TB-303 circuit boards. The background is a painting by Adriana Hardy, whose paintings are drawings are at the ../../gallery/ section of this web site. You may be interested in my 1993/94 material on Music Marketing via the Internet, especially with electronic delivery: ../../musicmar/ . Martin Röthlisberber in Switzerland http://acid.ch custom-makes AluCases for TB-303s and Devil Fishes. These are machined from solid billets of aluminium. They are anodized and the engraved lettering hand-painted with epoxy paint. See #alucase above for more information. Photos of some of his AluCases are in the photos/ directory. Check out the BugBrand BoardWeevil 2012 (link) from Tom Bugs in Bristol, England. This creature is a denizen of the catacombs of Idiosyncrasy City. When the time comes to cast off the constraints of 16 beats to the bar, 12 pitches per octave, synchronization, tuning and the entire boxy concept of notes, this creature would be an excellent traveling companion. Note the 18 body contact pads and the two light-dependent resistors (LDRs). 3 square wave oscillators (audio and low frequency switchable), two ring modulators and a filter. There's a pot and LDR for power-supply starving, so the whole machine self-modulates itself according to its instantaneous current drain. 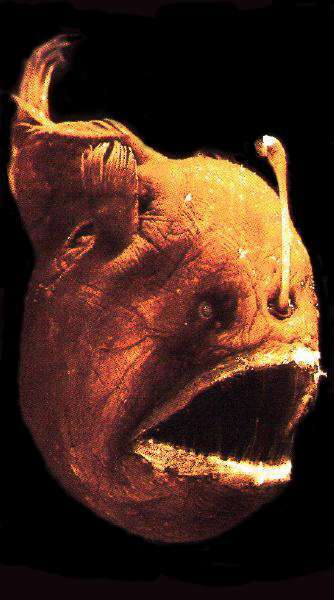 This would make an excellent source of signals for the Audio In to Filter of the Devil Fish. Tom Bugs also has other devices and a complete modular synthesizer system. From New Zealand, extraordinary upgrade kits for the Korg PolySix, and Roland Juno 108 and JX-8PJ : http://kiwitechnics.com. NiCad battery corrodes the PolySix controller board to the point where it cannot be repaired? No problem: create a whole new controller board with a modern CPU, flash memory (no need for batteries) and a host of new MIDI capabilities! Projects like this require a huge investment in developing the hardware, firmware and documentation. The operators begin a process which develops into a shape beyond their authorship; the operators become gardeners, watering and pruning, mulching and composting sound. The music becomes a contrapuntal morass, twining and climbing, chirping, buzzing, blinking, snapping. The operators guide the instruments, and the instruments carry the operators and others through an ever metamorphosing landscape. Google reports that the word "MIDI" does not appear at the Dewanatron site. These are extraordinarily physical sounding electronic instruments, with a 1950s science-fiction sensibility about their mechanical embodiment: all wood, baked enamel paint, chicken-head knobs, the the odd telephone dial and a keyswitch to power up the Swarmatron. The Devil Fish is keen to become acquainted with these beautiful, exotic instruments! Add some reverb - ideally in a real room, auditorium or underground vault - roll tape (or whatever it is these days) and play. WikiPedia has a good page: en.wikipedia.org/wiki/TB-303 . There are a bunch of mailing lists, including Analogue Heaven, at Hyperreal: www.hyperreal.org/music/lists/ . Hyperreal is an excellent site with many resources of interest to electronic music and rave culture. In particular, the section on musical instruments is of interest: machines.hyperreal.org. The TB-303 section is at: machines.hyperreal.org/manufacturers/Roland/TB-303/ . This page includes scans of the TB-303 schematics. SonicCouture www.soniccouture.com/en/products/p42-devilfish/ in London have DVD with a bunch of samples of a Devil Fish, which are playable in the Native Instruments Kontakt 4 player. A second outfit to sample the Devil Fish for use in digital audio software is Sonic Faction . 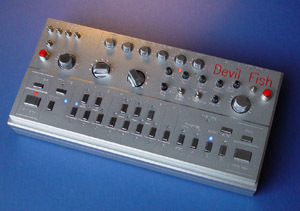 Their "Evil Fish 303" functions as a plug-in instrument within Ableton Live, with on-screen controls and interfaces to hardware devices such as the Novation Launchpad . The promo video, from late 2011: http://www.youtube.com/watch?v=5hcZI5toStQ This no-doubt does some things a physical Devil Fish can't do, but generally it wouldn't compare with the hands-on use of the real Devil Fish. Still, it costs $20 and comes with a free Whoosh Machine white-noise-based plug-in instrument. The Propellerheads www.propellerheads.se are legendary for ReBirth, the excellent software emulation of two TB-303s, a TR-808 and a TR-909. CustomSynth.co.uk www.customsynth.co.uk . Please see the photos/ directory for an image of Jeff Toman's radical restoration of a badly worn TB-303 plastic case, for a machine which I had just converted into a Devil Fish. The main Roland site is www.roland.com. From there you can reach the various subsidiaries and distributors in other countries. Nothing to do with the TB-303 or Devil Fish, but a fascinating site for musical instrument history: www.obsolete.com/120_years/ However the site is now defunct . . . . The history can be found at: https://web.archive.org/web/20070202032312/http://www.obsolete.com/120_years/ . 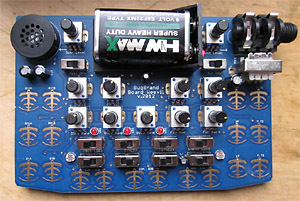 Check out the two oscillator Future Retro 777 sequencer-synthesiser: www.future-retro.com/. 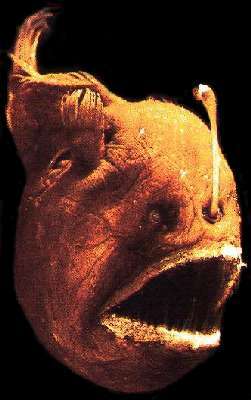 While you can easily plug a synthesiser into the Audio In of the Devil Fish to give you more "oscillators" the main spirit of the Devil Fish is a relatively straightforward oscillator feeding an intense and convoluted process of filtering, distortion, gain control, more distortion and then perhaps some Filter FM. A MixMag interview with Hardfloor, the quintessential 303 maniacs: www.techno.de/mixmag/interviews/Hardfloor1.html . 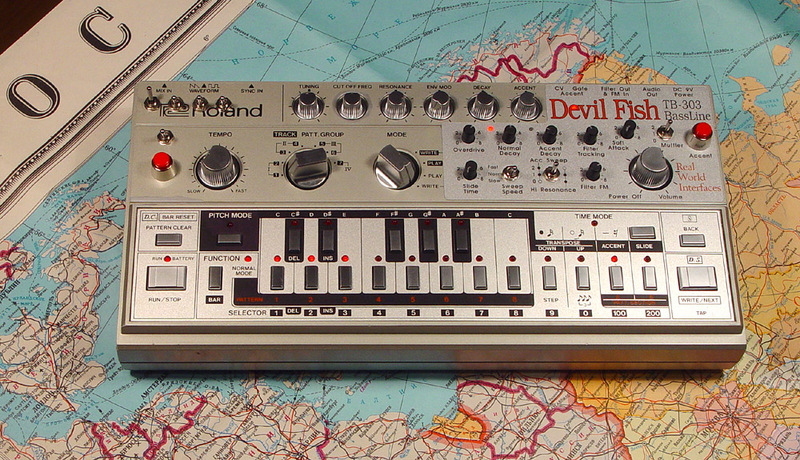 A vast array of information about synthesizers, including the TB-303, is at www.vintagesynth.com/ . The 2000 x 8 bit mask programmed (the bits are built into the chip as a final stage of manufacture) program ROM is in the lower right corner. Above this is the 96 x 4 bit RAM (local registers in a microcontroller). In the TB-303, three 1024 x 4 bit battery-backed-up static RAM chips are used for storing patterns and tracks. The TR-606 and TR-808 use the same type of chip, but the mask programmed ROM would be built with different data. http://blog.kevtris.org/blogfiles/Handhelds/Datasheets/uCOM-43-uPD546-dv.pdf The instruction set for the uCOM-43 series. 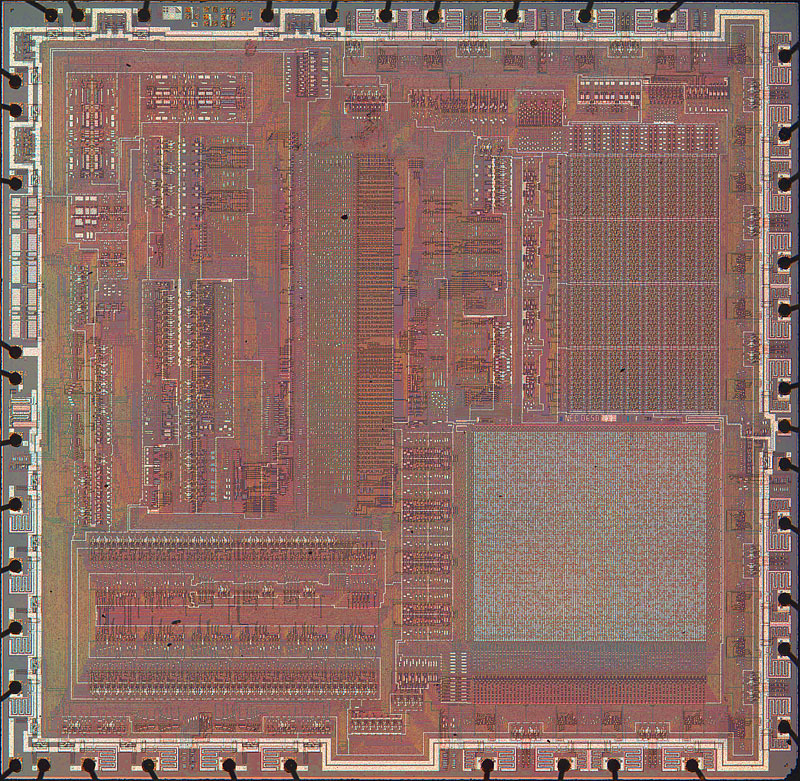 https://archive.org/details/bitsavers_necdatabooterCatalog_28821093 NEC 1982 catalog mentions the upD650 in a block diagram. The image below is an illustration of from Volume 2 of the three volume set The Science of Life by H. G. Wells, Julian Huxley and G. P. Wells from 1929-39 (I think). Click the image to see the full page and some more devilish deep-sea creatures. 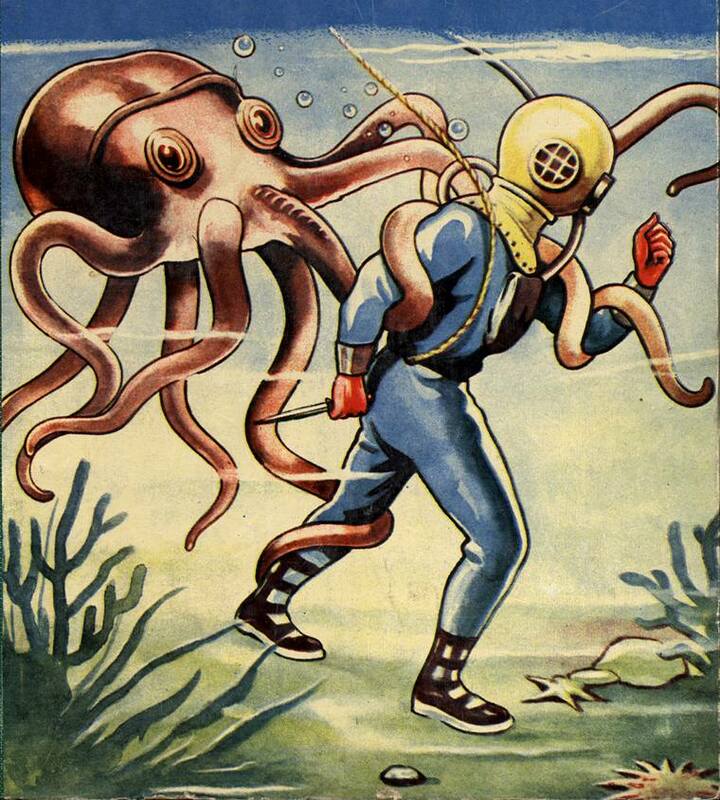 Q1: "Can the Devil Fish still make the sounds of the TB-303?" Yes. 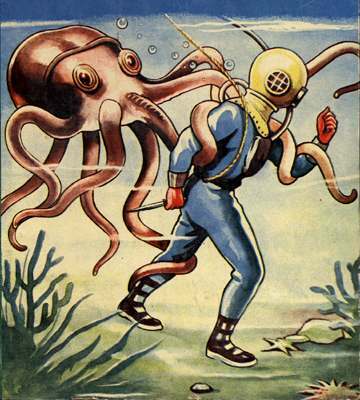 See page 7 of: Devil-Fish-Manual.pdf for how to restrict the Devil Fish to the TB-303 subset. 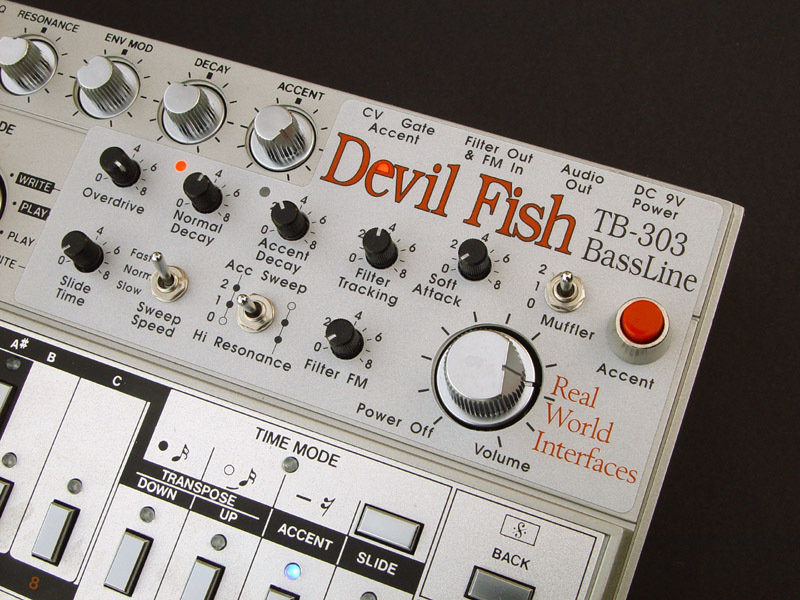 It was always my intention that the Devil Fish sound-space be a super-set of the TB-303s, but with repeated fast accented notes, the Version 1.x Devil Fishes did not sound identical to the TB-303. 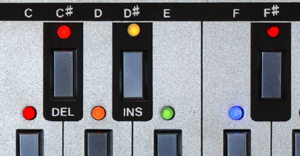 This lead to the development of the Sweep Speed switch, with the "Fast" mode being that of the version 1.x machines, the "Normal" being that of the TB-303 and the "Slow" being a super wide and sloppy version of the TB-303 response. This switch was retrofitted to several of the 18 Version 1.x machines, so there remain about 15 or so which cannot do everything a TB-303 can do. The TB-303 has a weedy bass response due to the low value of capacitors C20 and C21. These are replaced with larger capacitors in the Devil Fish, so if you want to replicate the TB-303's thinner bass sound, you should use external filtering such as the bass EQ control of a mixer. Q2: "Does the Devil Fish have MIDI?" Yes – MIDI In. MIDI Out will soon be available. Please see the midi-options/ page for more information on this and an two other approaches to providing MIDI In and Out. Q3: "Do you have any TB-303s for sale, or do I know of any?" Sometimes. Please contact me if you wish to buy or sell a TB-303 and I may be able to put you in touch with someone. See above: #tb303sforsale . Q4: "Are you going to make a standalone Devil Fish?" One day. It is a very big project to do it as well as I believe it should be done. Q5: "Is it OK if a TB-303 has the Kenton CV/Gate/Slide/Accent/Filter input sockets?" Yes. Before doing the modifications, I remove the sockets, fill the holes with epoxy, paint them silver and then carefully drill the Devil Fish holes with my template. Q6: "My TB-303s pots are stiff. Can you replace them?" The 6 small pots (potentiometers Tuning to Accent) typically are rather stiff. This friction may be reduced if the pots have been used a lot and/or if the pots are warm. The friction in the pot is not caused by the wiper on the carbon track, but by a special part of the shaft rubbing on the case in the presence of high-viscosity silicone grease. By dismantling the pot, it is possible to remove that grease and replace it with less viscose silicone grease, which makes them move relatively freely. As noted above, I can install a new set of 6 small pots, identical to those used in the Cyclone Analogic Bass Bot (though in 2016 it seems they started using a different type of pot). I have replacement Tempo and Volume pots from Technology Transplant, but the original pots are typically highly reliable. Crackling noise in the Volume pot is common, now these are a few decades old. I fix this by dismantling and cleaning the original pot with isopropyl alcohol. I normally install low-viscosity grease in the 6 small replacement pots. Some people think that stiff pots are a sign that the pots themselves are substantial and likely to last a long time. There is no such relationship. I think the original stiffness of the pots, at least in cold conditions, is too stiff. Making them significantly less stiff enables them to be turned faster and with greater ease. Q7: "The TB-303's memory contains precious patterns. Will they still be there after the Devil Fish modification?" Q8: "Do you install Ultra Violet LEDs?" No. UV LEDs produce very little visible light and plenty of UV, which may be damaging to the eyes – especially up close with the iris wide open in dark conditions. Q9: "What about spare parts, repairs to Devil Fishes and TB-303s"
CPU chip –an early 1980s NEC 4 bit device with mask-programmed (i.e. the pattern built into the chip at the manufacturing stage) software. See the D650-133 photo above. This family of CPUs has not been manufactured since 1984, so even if it was possible to extract the software from a TB-303 CPU, there is no available chip which will run it. However . . . from 2012 until around 2017 there was a CPU Replacement system (Quicksilver 303) and since around 2017 there has been another one: https://www.sonic-potions.com/re303 . This could be used directly. There should be some original TB-303 CPUs available as the result of installation of these systems into TB-303s. The six synthesiser control pots. 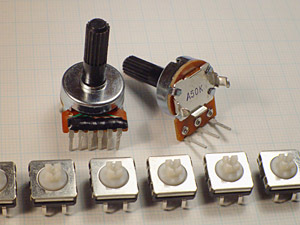 This style of potentiometer has not been manufactured by Alps since the early 1980s. Sound-to-Parts (eBay store) sell sets of six small pots. See 303-mods/ for more information. The TB-303 case, battery holder cover etc. 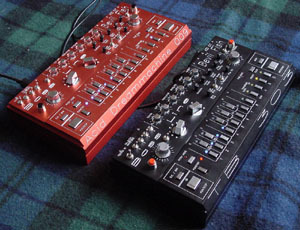 The cases can be obtained from a scrapped TR-606, as can the knobs and buttons. The metal panel part of the case is no longer obtainable. Sound-to-Parts (eBay store) sell excellent kit with a newly manufactured battery compartment cover, and two battery contacts – the positive metal contact and the negative spring contact. They may also sell chrome-plated reproduction buttons and knobs. As far as I know, these buttons are made for the Cyclone Analogic Bass Bot, and the holes for the tact switch stems are a little bigger than is ideal for the TB-303's original tact switches. The solution to this is to install Omron sealed tact switches, as mentioned above, which have the slightly larger switch stems to suit the Bass Bot buttons. The DIN Sync socket with switch. (Roland part number 13429706.) The socket is reasonably standard, but its integral dual pole switch is unique and unobtainable. A workaround is to install a toggleswitch instead. Fortunately a number of hard- or impossible-to-obtain parts never seem to fail. These include the Tempo (actually, I have a report of one failing) and Volume pots, the miniature transformer in the power-supply and the dual-transistors in the VCO and filter. The Volume pot can become noisy. The solution is to dismantle it and clean it with isopropyl alcohol. The rotary switches never seem to fail. ALPS still makes them, but getting one could be tricky. The 6.5mm Output, Headphone and Input sockets (Roland part number 13449218, or is it 13449217?) are no longer available from the original manufacturer, Hosiden, but they are extraordinarily reliable and I have never had to replace one. Considering the use these sockets have had over the last 35 years, the fact that they always (in my experience) work reliably is a testament to Hosiden's design and manufacturing expertise. I do not do general service work. However, I do maintain machines I have modified, and of course repair machines prior to modification. I also do repair work on TB-303s, TR-606s and TR-808s. See the page on modifications 303-mods/ for more details of maintenance, spare parts and alternatives for replacing pots. See above: #tact_switch_kits regarding purchasing modified Omron tact switch replacement kits. See 303-mods/ regarding the 1K x 4 bit memory chips, which sometimes fail. Q10: Other maintenance questions regarding knobs, pots, switches, contamination etc. Never let anyone spray anything inside any equipment you care for!!! (With the possible exception of isopropyl alcohol if you really know what you are doing.) Many TB-303s have been damaged by people spraying oily and/or corrosive liquids inside them. It is possible to remove the oil – but only be removing some components and soaking the whole PCB in a hydrocarbon resembling petrol. Please see 303-mods/ for more information. Apart from the images of aquatic Devil Fishes, and the sound samples by other people, all material in this /rwi/dfish/ section of the web site is copyright 1996-2016 Robin and Tina Whittle. If you would like to use some of this material for your own purposes, please ask: rw@firstpr.com.au . The photo at the top of this page is different for each day of the week. 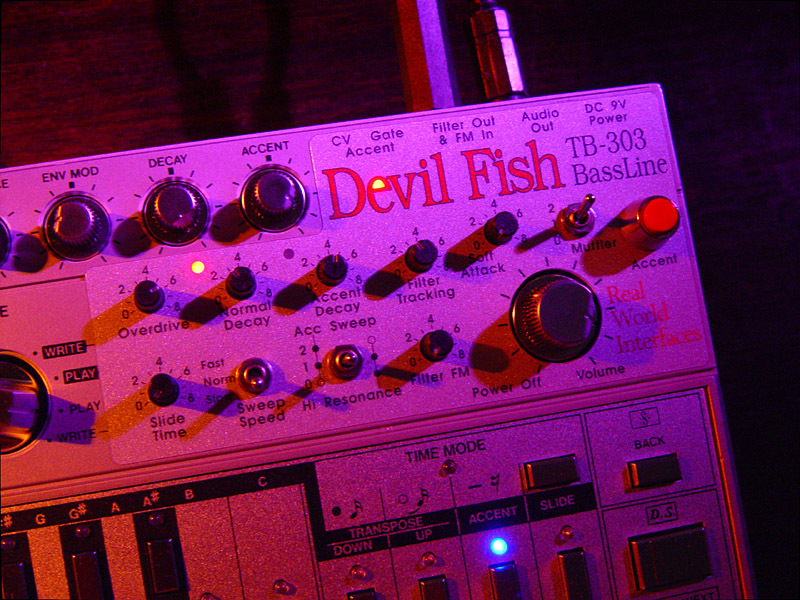 The photos are Devil-Fish-TB-303-front-panel-00.jpg to Devil-Fish-TB-303-front-panel-06.jpg . If you wish to link to this site, please link to: http://www.firstpr.com.au/rwi/dfish/ and let me know. I will add your site to the links section.